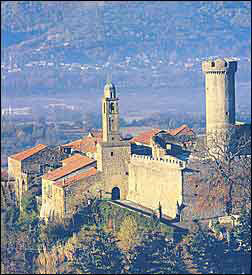 This medieval castle in Pontremoli, Italy will provide classroom space for Tuscany field school students. From the pastoral hamlets of Northern Italy, to the Spanish-colonial cities of central Mexico, Sam Houston State University is taking its educational show on the road. Two field schools -- one headquartered in a quiet valley among the castle-strewn hills of Tuscany, Italy and the other in the urbane mountain city of Puebla, Mexico -- highlight the university's summer '99 course schedule. These foreign programs are an important part of ongoing efforts at SHSU to increase the international focus of university curriculum. The field schools offer a variety of college-accredited courses taught by SHSU faculty and designed to take full advantage of their unique foreign settings. In addition to basic coursework, field school students can expect to be thoroughly immersed in the cultures of their host countries. "The cultural exchange will transcend the classroom experience," said Alessandro Bonanno, chair of the SHSU sociology department and director of this year's Tuscany field school. "We're offering a fully integrated curriculum which encourages a great deal of contact with the local population." 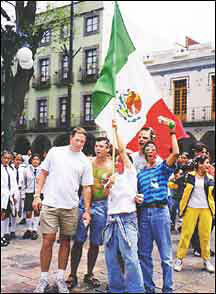 SHSU Puebla field school students join Puebla citizens celebrating a Mexican victory in the 1998 World Cup. These close cultural encounters are among the most memorable aspects of the field school experience according to veterans of previous SHSU foreign studies programs. "Students begin to assimilate with the culture right away," said Frieda Koeninger, an SHSU foreign language professor who is returning to direct the Puebla program for the second year in a row. "They go out on the street and start surviving -- eating, shopping, walking around and making friends." SHSU field school itineraries will provide students with an insider's view of the host countries. Activities include extended visits to nearby cities, backroad trips into the surrounding countryside, specially arranged tours of local businesses, institutions, and points of interest, and guest lectures by faculty from area universities. Also, a number of social events are staged, allowing visiting students opportunities to mingle with local residents, students, and even business and government officials. "You really get to experience everything first hand," said Betsy Torrez, an SHSU geology professor who taught a course in Puebla last summer. "You just live it. There is no way you can forget it. I felt like I learned as much as the students." 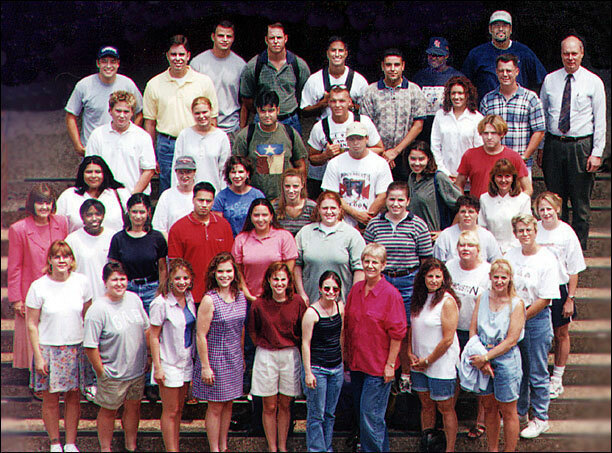 Both SHSU field schools coincide with the first session of the university's 1999 summer semester. The Tuscany field school runs from May 29 through June 19 and costs $2,500 plus the regular tuition fee for the summer session. The $2,500 covers meals, hotel accommodations and air transportation. The Puebla field school runs from June 6 through July 6 and costs $1,450 plus the regular tuition fee. The $1,450 covers hotel accommodations, air transportation, 25 meals and ground transportation for selected field trips. The tuition fee for the summer 1999 sessions has not yet been established, but university officials project enrollment costs similar to last year when a three-hour course ran $228.50 and six hours cost $407. Scholarships funding SHSU student study abroad are available through the university's International Studies Program. Guidelines and application packets may be obtained from Raymond Teske, chairman of the International Education Fee Scholarships Award Committee. Teske may be reached in Room C104 of the Criminal Justice Building or contacted by phone at (409) 294-1667 or (409) 295-6274. The application deadline for the summer 1999 field schools is 5 p.m. Oct. 30, 1998. Awards will be announced by Dec. 1. 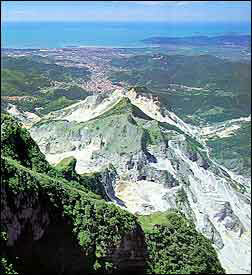 The Carrara marble quarries located by the Mediterranean coastal city of the same name, will provide Tuscany field school geology students an extraordiary opportunity. The quarries, which have existed since pre-Roman times, provided rock for Italy's great architectural and artistic masterworks. The Lunigiana region of Tuscany, Italy will be the base of operations for students enrolled in the Tuscany field school. Known as "The Valley of Castles," the region, nestled in the Apuan Alps, is marked by the towers of more than 100 ancient castles and fortified villages. Two of those castles, one in the medieval hamlet of Pontremoli, and the other, a ninth century fortress in Aulla, will provide temporary classrooms for the field school. Geology -- "Physical Geology" and laboratory. "The region provides a perfect setting for these courses," said Bonanno. "It has a wide variety of environmental, geological and physiographic domains within a surprisingly small area." The fortress at Allua, the meeting place for environmental students, is now a natural history museum and headquarters for Italy's Landscape Ecology Laboratory. Of special significance to geology students will be the world famous Carrara marble quarries located by the Mediterranean coastal city of the same name. The Carrara quarries, which have existed since pre-Roman times, provided rock for Italy's great architectural and artistic masterworks. The city is dotted with workshops where, for centuries, whole dynasties of sculptors -- Baratta, Finelli, Fontana and Triscornia, to name a few -- carved statues and monuments for the great courts of Europe. Geology students will not only have the opportunity to study the quarry, Bonanno said, they will also be invited to participate in an international marble producers exhibition to be held in Carrara during their visit. In addition to hearing classroom lectures from noted Italian scholars, the field school students will have an opportunity to attend a few specially scheduled classes at the nearby University of Pisa. "This was where Galileo taught physics," said Bonanno. "It is one of the most prestigious universities in Europe." In addition to the Pisa visit, side trips and weekend adventures are slated for nearby Italian tourist hotspots like Florence, La Spezia and Genova. But for most of the trip, students will frequent the small villages of Lunigiana, an area known for its beautiful mountains, wonderful cuisine and exports like fine wine and olive oil. Bonanno said Tuscany field school applicants need not worry about language barriers. All classes, including guest lectures from Italian professors, will be conducted in English. Also, because of the region's appeal to international tourism, he said, many of the local residents speak English. For additional information on SHSU's Tuscany field school, contact Alessandro Bonanno (sociology) at (409) 294-1512, Richard Payne (political science) at (409) 294-1457, or Christopher Baldwin (geology) at 294-1401. More details can be found on the SHSU Tuscany field school web site. 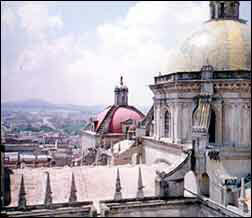 A view from a bell tower of Puebla's Cathedral of Immaculate Conception. Located about 7,000 feet above sea level, in a valley surrounded by Mexico's highest volcanoes, Puebla is widely considered the country's most beautiful colonial city. It was founded by immigrants from Spain's Talavera region who, unlike many 16th century fortune seekers, came to the New World to stay. Though today, Puebla is one of Mexico's most important industrial, business and financial centers, it maintains its historic Old World ambience. Still standing are lavishly adorned churches, government buildings, and even Mexico's second largest cathedral -- majestic testaments to the city's deep European roots. So rich are Puebla's architectural treasures, the Mexican government has declared the entire city a national heritage site. SHSU's affair with Puebla dates back to the 1940s when its first Mexican field school was established. Over the years, in spite of occasional suspensions of the program, the university has developed strong ties with Puebla's people and institutions. This summer marks the third year since the field school's most recent revival. Judging from the success of the two previous years, organizers are anticipating yet another exceptional south-of-the-border adventure for all who sign on. History -- "Mexico and the Caribbean: National Period" and "Contemporary Latin America." Through each course students will be introduced to the culture, history and institutions of Mexico. But the most memorable cultural encounters often occur outside of the classroom. "In their journals and in course evaluations," Koeninger said, "students often cite relationships developed with their new foreign friends as the most rewarding experiences of their trip." Among those new acquaintances are many SHSU alumni who call Puebla home. When the SHSU field school comes to town, the former students welcome the new students in style, throwing a lavish fiesta and inviting college students from some of the many Mexican universities in Puebla to join the fun. "The Mexican alumni have a whole lot of affection for Sam Houston and for the people who helped them out when they were in Huntsville," said Koeninger. The '98 alumni fiesta was held in the beautiful home of Lourdes Casillas, an SHSU alumnus who owns a language school in Puebla. "The general consensus -- Wow!" reported Marshall Martin, an MBA student who attended the '98 field school. "She provided us with great food, fun and even a mariachi band!" In Puebla, students will stay at the regal, 19th century Palacio de San Leonardo, a hotel in the middle of the city's historic district. Complementing classroom work in the hotel, will be a series of specially arranged tours of local historical and architectural sites including the many fabulous churches and the massive Cathedral of Immaculate Conception. Also on the agenda is an introduction to Mexican municipal government highlighted by a tour of the Palacio Municipal, Puebla's ornate city hall. 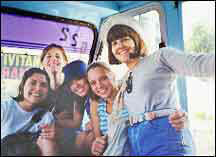 1998 Puebla field school students join director Frieda Koeninger for a bus ride into the Puebla countryside. Outside of Puebla, students will have an opportunity to visit two major pre-Columbian archeological zones including the giant Cholula pyramid located in the shadow of the snow-capped Popocatépetl volcano. 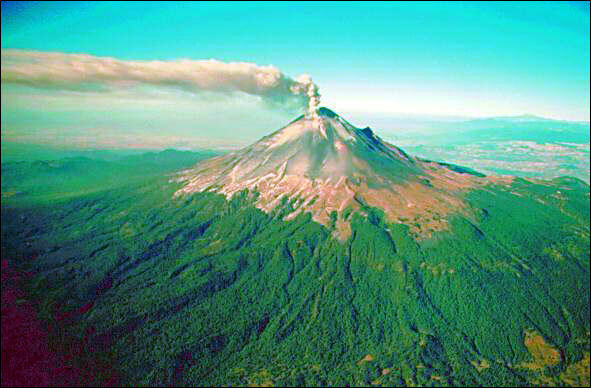 The 17,900-foot peak actually erupted during the 1997 SHSU trip, and remains one of the most active volcanoes in the Western Hemisphere. Whereas Puebla has strived to preserve its Spanish heritage, the nearby town of Cholula offers students a view of Mexico's rich Indian culture. "In the town market, you can still hear the Indian language being spoken," said Koeninger. "It gives you a sense of all of the layers of cultures and times in that area." Highlighting the trip is a visit to Mexico City, about a two-hour drive west of Puebla. The excursion includes tours of the city's world famous art and anthropological museums and visits to several historical landmarks. A special treat for business students includes a tour of the Mexican Stock Exchange. In addition to group field trips, each course will have its own special agenda. Business students, for instance, will meet with area businessmen and tour their operations. Past tours have included visits to Puebla's Volkswagen plant and the Swedish-based SKF Bearing Manufacturing Company. For additional information on SHSU's Puebla field school, contact Frieda Koeninger at (409) 294 1443.